We are getting so excited for the ARC March for Choice on Saturday September 29th. We have been sharing blogposts which describe what this March means to our members. Paula is a Dub living in Kerry. She is the current convener of Kerry for Choice. 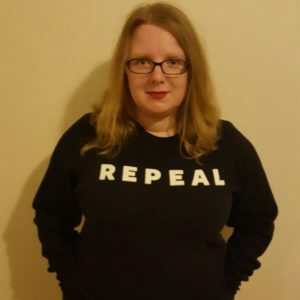 It’s almost 4 months since we repealed the 8th, but the reality is that nothing has changed for pregnant people in Ireland. Until legislation is implemented, 9 people a day will continue to travel, with 3 more forced to take safe but illegal abortion pills. This is why I’ll be marching on September 29th. This is my third March for Choice. I’m marching behind the Kerry for Choice banner in solidarity with the one woman every week who leaves Kerry to access abortion care abroad. I’m marching for those who travelled, those who took pills at home and for those who could do neither of those things. I’m marching for everyone who has told their story. As well as for those who haven’t shared their experience and maybe never will. I am also marching for myself. I’m still processing the referendum win. I keeping thinking it has finally sunk in, until the tears or numbed feelings return. I know I’m not alone in this, so I’m looking forward to catching up with friends. This year’s march is special; a protest, but also a celebration. For years we marched looking for a referendum. We jumped through the hoops of the Citizens’ Assembly and the Joint Oireachtas Committee. As soon as the referendum was called, we used our collective voices to canvass friends, family and neighbours. We knocked on strangers doors asking for abortion rights. Many of us were asking for our own rights. We spoke. We listened. We answered questions. We made ourselves heard via ballot boxes. We won. Now is not the time for silence. Now we must be loud and proud in our call for the Government to legislate. We still have work to do, but look how far we’ve come. Look what we have achieved. We are stronger together, so I hope you will join me in demanding that abortion be free, safe, legal and accessible to everyone who wants or needs it.